EGB (previously known as Egamingbets) is one of the older betting sites dedicated to esports betting only. The service has launched in 2011 and is offering a big variety of different Games, leagues and tournaments. Moreover egamingbets has a live stream available for most of the events you can place bets on. The integrated chat gives users the opportunity to discuss odds and bets as well as the matches running on the streams. The company is located in Costa Rica and its service is regulated by the local administration. Besides real money betting, egamingbets is offering a “playmoney” mode for all registered users. If you are not very familiar with how esports betting websites work this is the perfect way to try it out without risking any real money. In order to use the “playmoney” option you need to register. Egamingbets is one of the few gaming sites that accept bitcoins. Egamingbets is offering a wide variety of different leagues and tournaments for LoL, Dota, Starcraft and CS:GO. Moreover they have lines for some of the bigger Hearthstone, Smite and World of Tanks events. You can combine any bets in order to create multiple bets. Egamingbets is offering single and multiple bets (expresses). In case of a best of 3 event you can also bet on the outcome of the first and consecutive maps. Moreover the esports betting site if offering odds for tournament winner and sometimes handicap bets. All betting types are available in real money and play money mode. The service of egamingbets is carried out in accordance with the local laws of Costa Rica. Costa Rica is none of the high security areas when it comes to betting licenses. Although it is said that the government is working on setting up a board to regulate gambling services registered in Costa Rica at the moment there is no valid information about the progress of this undertaking. At the moment egamingbets is offering the highest bonus of all major esports betting sites. New users will get a 100% bonus on their first deposit up to the maximum amount of $ 600,-. The thing is that you don’t get the bonus directly into your account after your deposit. In order to receive the bonus you will have to earn it by placing bets. For all of you familiar with online poker it can be compared to the rakeback systems used there. So here is how works: For every Dollar you bet (on odds higer than 1.30) you will get 10 egamingbets points. These points do not only clear your bonus step by step but can moreover be used in the shop system to get free stuff (read more about points below). In order to clear one bonus dollar you will have to earn 500 points which is worth $ 50 in betting stakes. The complete bonus amount will divided in 5 parts. Each portion will be transferred to your account as soon as you have earned the required points for this part of the bonus. The bonus amount expires after 3 months. The minim stake in order to receive points towards wagering requirements is $ 1,-. Withdrawals and further deposits do not affect the bonus as well! Check all bonus offers for eSports betting here. You make a first deposit of $ 100,-. You are now eligible for a $ 100,- bonus. The bonus will be transferred to your account in 5 x $ 20,- portions once you have earned the necessary points. To receive one portion of the bonus you need to earn 10,000 points with equals wagering a total of $ 1,000,-. To clear the full bonus amount you need to earn 50,000 points with equals wagering a total of $ 5,000,-. This may not be the best system for casual players but can be very rewarding for players who want to play frequently as the maximum bonus amount of $ 600,-is 6 times higher than the next best bonus for esports betting offered by Bet365. The bonus conditions were updated on Jan, 31st 2015. Players that aquired a bonus before this date still have the old bonus conditions. No further requirements have to be fulfilled in order to cash out the refer a friend bonus of egamingbets. Of course you can use it to place bets as well! As mentioned above you receive 10 points for every Dollar your wager on odds higher than 1.30 at egamingbets. These points can used in the online shop of the betting site. In the shop you can change your points for gaming stuff such as mouses, headsets and other useful things. Moreover you can use your points to get real or bonus money. In order to recieve points it does not matter if you loose or win your bet. 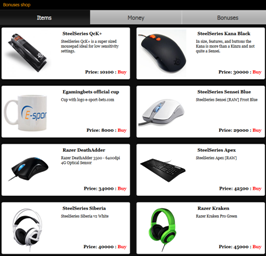 Worldwide shipping is included in all products inside the egamingbets bonus points online shop. You use the following options to transfer money to your egamingbets account if you want to use the real money betting service. Please notice that not all payment options are available in every country / region. Your first withdrawal per month is free. After that you will have to pay a fee for consecutive withdrawals in one single month. We asked an employee of egamingbets and got the following answer: “Egamingbets is accepting players from all countries except US. And of course you have to be of legal age. Even eSports-Pros are allowed to bet but they must not bet on their own matches!” Please be sure to check your local legislation and laws before registering for real money betting! You can find the support chat in the right sidebar of the egamingbets website. Moreover you can contact the support via email using [email protected]. The customer support of egamingbets is available 24/7. The support of egamingbets has made a short video that will lead you trough the registration process and offers advice on how to deposit and how to place your first bet. Just click play to watch it! Egamingbets is definitely offering a lot of matches and whole bunch of bonuses and promotions. The weak point of the betting site is the Costa Rica gambling license. Some security is added by the checks the ewallet services like Skrill do when adding a betting site to their service. If you want to check out esports betting at egamingbets we think the play money options is a good way to start. They way egamingbets is combing live streams and esports betting is good idea. It is definitely more exciting to watch a match you have placed a bet on. *.) All this information is given without liability. Please check bonus conditions on the website of egamingbets.com or ask the support of the betting site for further information. No warranty!